Ernest John Ackers enlisted on 19th April 1915 in St Helens and was transferred to 4th Batallion Sherwood Foresters (Notts & Derbyshire Reg). On the 13th November 1917 Ernest was posted to France, but reported as missing on 21st March 1918 and officially accepted as a Prisoner of War on 17th October 1918. When being taken prisoner Ernest was wounded and had to have the thumb and index finger of his left hand amputated in Germany. He was eventually discharged on 11th December 1918 as no longer physically fit for service. Ernest was entitled to British War Medal & Victory Medal. Red Cross POW records have him born on 1st January 1888 in Rainhill and his mother Martha shown as next of kin living at 2 Birchley Street, St Helens. 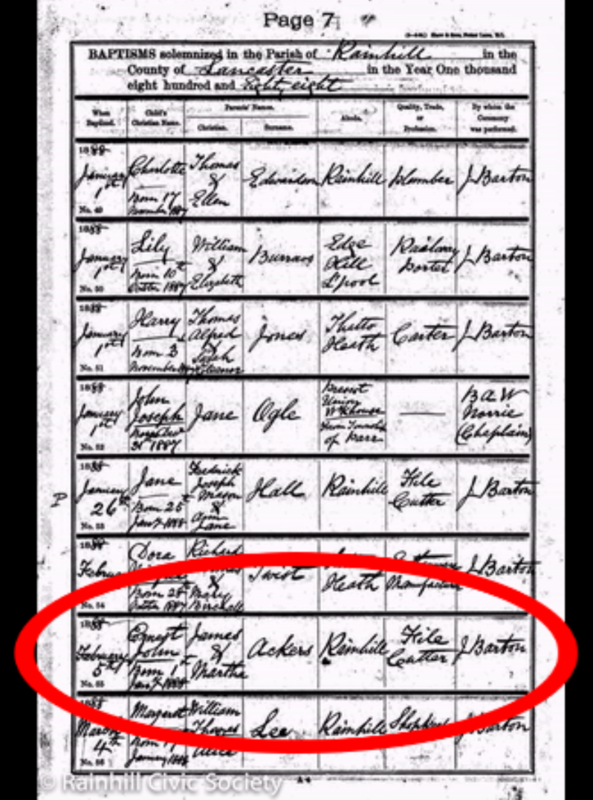 Census records from 1891, 1901 and 1911 show Ernest living in St Helens and being born in Rainhill. Below is the record of Ernest's Baptism on 5th February 1888.